We signed up for HP Instant Ink last summer. It's been 14 months, which gives us enough time to look at our printer usage and billing, and determine whether this was a good deal or not. 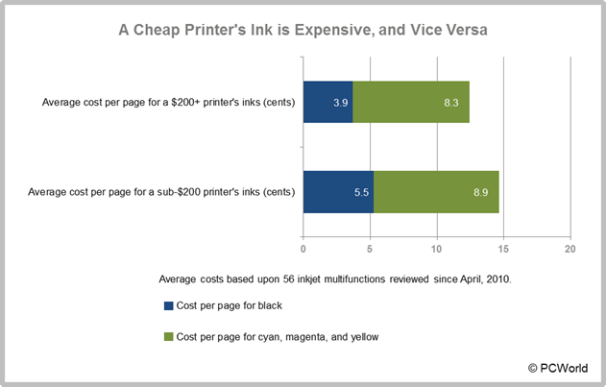 Keep in mind - this is based on OUR printer use, and whether Instant Ink saved US any money. 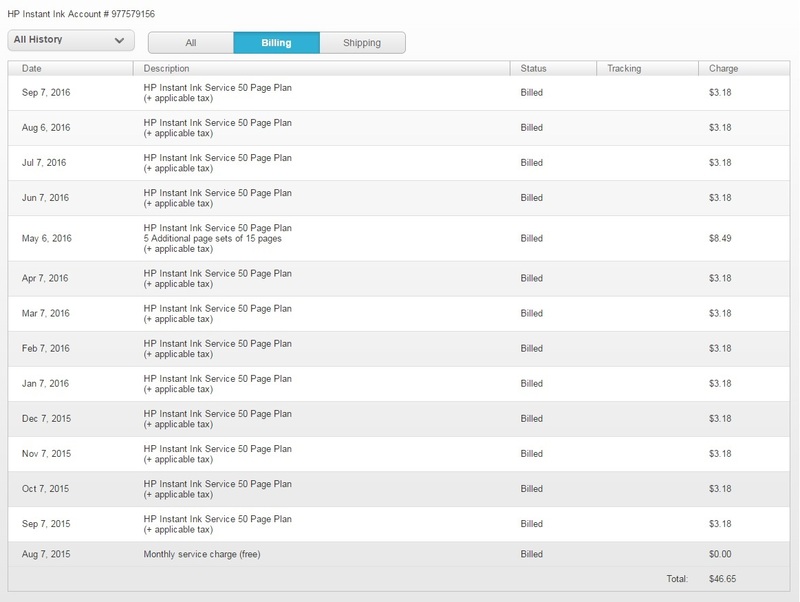 A person or business with different printer usage patterns will get different results. Let's go to the numbers! You know, as it turns out, we just don't print as much as we used to. But unfortunately, when we DO have a printing job, it tends to be pretty huge. Over the course of our contract, our monthly pages printed were 53, 11, 22, 7, 16, 175, 22, 32, 43, 9, 14, 0, 12, 4, 31. It's kind of neat to have access to this data. And back in late April / early May, we had to do quite a bit of printing for a school project - hence, the 175 pages. All told, during the contract period - 451 pages. Our billing was pretty consistent. Starting in September 2015, we were billed $3.18 (including tax), on a monthly basis. There was one month in which we incurred $8.49 in charges. All told, $46.65. All told, we're paying about 10.3 cents per page. At first blush, that seems a bit high. At the very least, it's not the remarkable deal we were expecting. 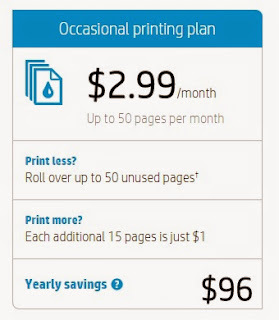 According to PC World, as of 2012, a black-and-white page on a cheap-ish printer like ours would run about 5.5 cents. Adding color adds another 8.9 cents - running the total to just under 15 cents/page. We mostly print in black-and-white... but our contract gives us the OPTION to print in color, too. So, a blended rate of 10.3 cents is definitely fair. 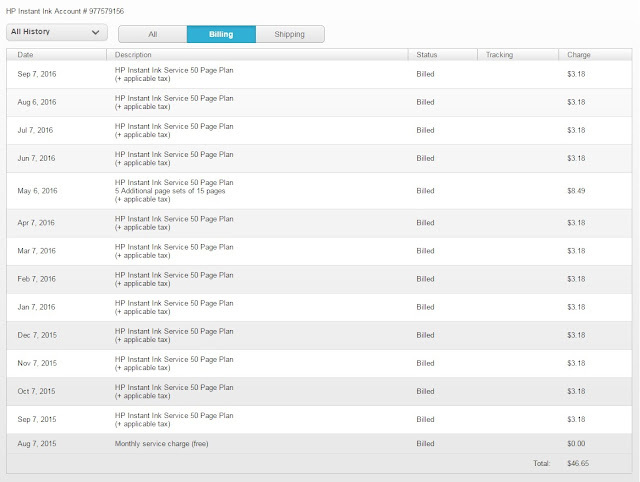 HP Instant Ink could have been a LOT better deal, if we'd used our page allotment more consistently. Heck, maybe we could have saved that $96 they advertised. As it stands, we left a lot of pages "on the table" - we printed only 30 pages per month on average, and paid our $3 even in months where we did no printing at all. At the same time, we incurred extra costs during the "spike" in printing during the 175 page month. If we'd used precisely 50 pages per month, our per-page cost would have been 6.3 cents - and every one of those COULD have been in color. Even with a year of "normal" usage, however - I can't say that it was a bad deal. The cartridges HP shipped us were extremely high capacity - they haven't run out yet. If we'd gone with standard HP 61XL cartridges, the black is $31 on Amazon and is supposed to yield 480 pages (6.4 cents/page), and the color is $35.25 and yields 330 pages (10.6 cents/page). Assuming a mix of b/w and color printing, I think we can assume an advertised blended rate of 7-8 cents. But if either cartridge runs out, it's another $30+ investment. As it stands, we never had to buy an ink cartridge, we had color printing capability for all pages, and our out-of-pocket, so far, is less than the cost of the first two cartridges we would have had to buy. Bottom line - if HP Ink is costing us more (or less) than we would have paid going it alone.... it's not by much. No complaints, but really, no excitement, either. Excellent write-up. Well thought out and clearly stated. 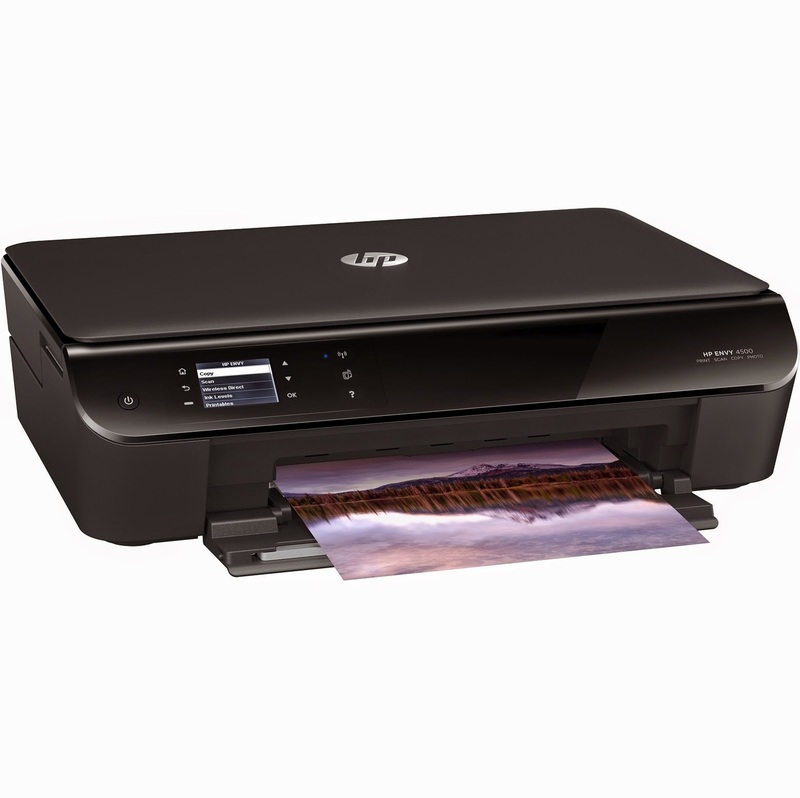 It will certainly assist me in deciding whether or not to go with the HP Instant Ink plan. May the road rise to meet you and may the wind always be at your back. The only problem with this story is that a cartridge that says it yields 480 black or 330 color but do not. I had to buy cartridges 3 ttimes a year a total of 180.00. 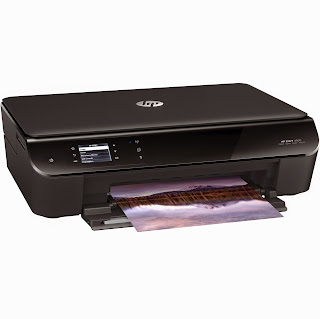 With hp instant ink a mere 36.00 a year. These cartridges are super high yield going on 2 years with the same cartridges. Plus before I used this plan I tried not to print in color because it was so expensive, with this program I dont worry about using color. I love it. This concept is a good (convenience) idea, but if you have a problem and need to call the Instant Ink customer service line, you're in for a really painful experience! Very lengthy hold times. Incompetent CSR's and a bunch of talk and just plain sucky customer service!